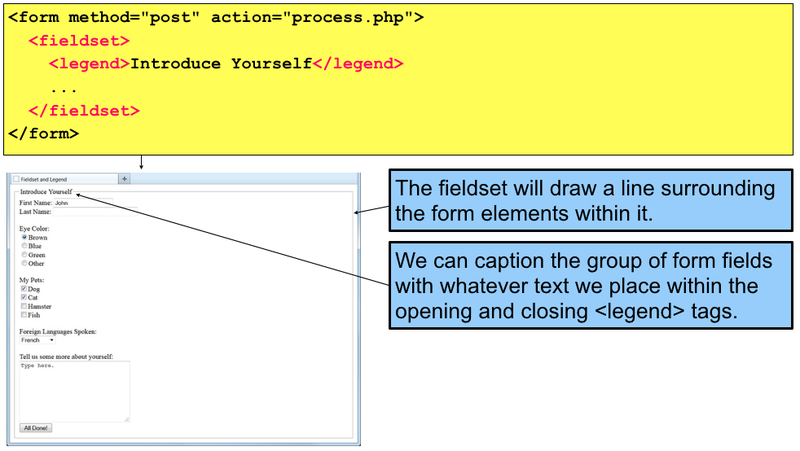 To create a web form on a page, we use the opening and closing <form> and </form> tags: The method attribute determined in which format the submitted data will be sent. The two possible values are “post” and “get”. The action attribute declares which file will receive and process the data once submitted. This will be a file written in a scripting language, such as PHP or ASP. Let’s begin adding some form elements. 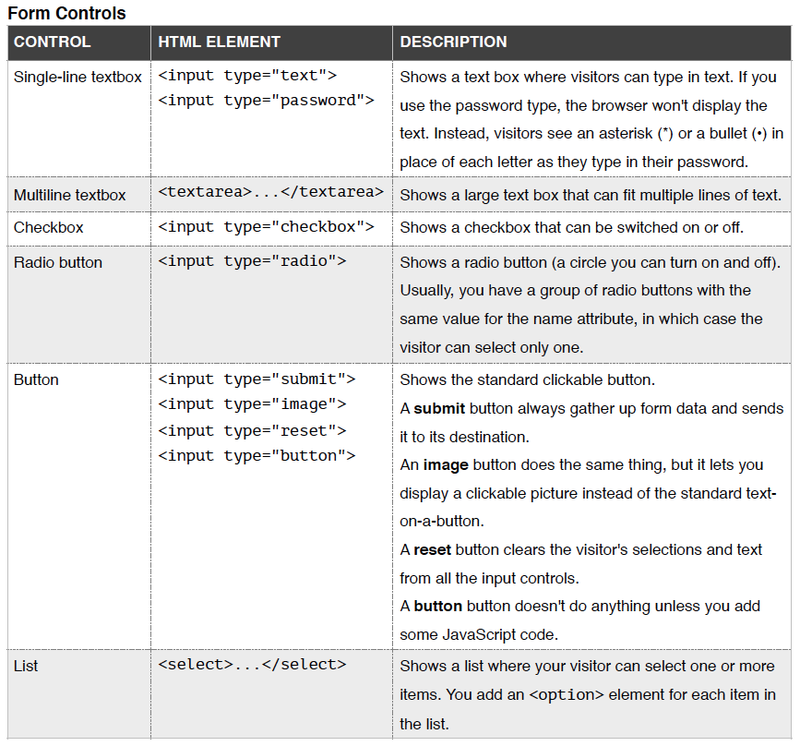 The most versatile component of a form is the <input> element. Here we are adding two text fields: The type attribute determines which kind of input the field will be. A value of “text” creates a single-line text box with the size attribute determining the width in characters. By changing the type attribute to “radio”, we can create a set of options, of which the user can choose only one: Notice that each radio option has its own input element, with the identical name attribute. Only the value attribute differs. We can use the select and option elements together to create a drop-down list of options on our form: The name attribute is applied to the select element, not the individual option elements. 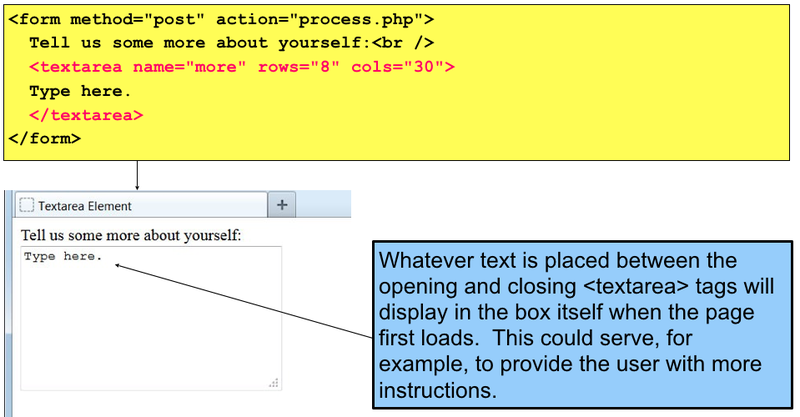 If a single-line text box isn’t big enough, we can use the textarea element to present a larger, expandable box that can hold a lot of text: The width and height of the box that displays on the web page is controlled by the rows and cols attributes, respectively.